News is being reported everywhere that Ben Roethlisberger is being sued by an unnamed (in the mainstream media) woman for sexual assault. Everywhere but ESPN that is. 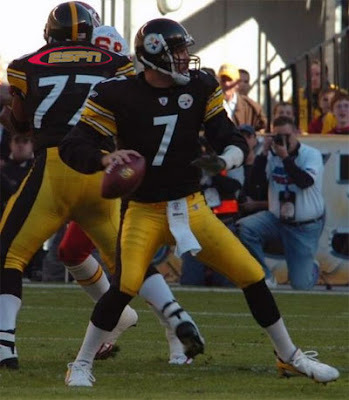 And there are a lot of conspiracy theories about why ESPN issued a "DO NOT REPORT" flag on the story. The best summary can be found on Sports Business Daily, which includes a very good point by Ken Fang of Fang's Bites. staff to not report the civil lawsuit filed against Ben Roethlisberger. ESPN really has no excuse for not reporting the allegations and lawsuit. It is news, It is a verified lawsuit. They are taking well-deserved blows for this, and any notion of a corporate firewall between the entertainment side and news side of the ESPN media empire is taking a severe beating. And one has to wonder how much pressure, if any, came down from Disney to keep it under wraps. But I have other questions for the rest of mainstream media. Why is the woman's name not being reported? This is not a criminal case, this is a civil suit that hits Roethlisberger's reputation. Why is her name being protected? TMZ has published it, and so have the Hollywood gossip rags and blogs: Andrea McNulty. Tell us why you are not publishing it? Why is the rest of the media not asking the simple question: Why did she not report it to the police and file a criminal complaint? Did she try and it was rebuffed? Why is she waiting until now to file a suit? Again, TMZ is reporting her side of the story, but I am not seeing it noted prominently elsewhere. And finally, a question for Roethlisberger's attorney. Why are you saying he will be "fully exonerated?" It is not a criminal case. It is a civil suit. Even if a jury sides with him at trial (if it ever gets to trial), it is not an exoneration. Of course it will be played up as one. Looks like we have a new "sensational story" for people to get wrapped up in. The question is how ESPN will handle it going forward? If there is any "good" news for ESPN, it would be the fact that that this story is in the top six at Googles trends (with people searching for "andrea mcnulty photos" and "ben roethlisberger accuser"), it does not show any ESPN crticisms in the top search returns. Of course, Erin Andrews is still the number three search term as of an hour ago.